Your browser configuration is preventing Grammarly Editor from loading. Please go to the browser settings, select Cookies and enable Third-Party Cookies. it’s as easy as 1-2-3!. This is the error message you would see if you were trying to correct the errors in your recently written article or post. When the Grammarly editor shows that you have made a grammatical error, you can correct it by clicking on the correct button shown when you hover over the error notification at the bottom of the WordPress editor or any web-based text editor. As soon as you click on the correct button you will see “your browser is Blocking Grammarly Editor” “Your browser configuration is preventing Grammarly Editor from loading. Please go to the browser settings, select Cookies, and enable Third-Party Cookies. It’s as easy as 1-2-3!” error message. Even though the error message says “it’s as easy as 1-2-3!”, it is actually not. The problem is a bit difficult to resolve than just enabling third-party cookies in your browser as recommended in the error message. Now Grammarly Editor extension for Google Chrome is something I would recommend to every blogger or the people who want to write a grammatically correct post or articles. This could also come in handy if you are an active user on Quora, Facebook or any other public question answer forum or social networking websites. The extension may not be perfectly correct all the time, but the errors are negligible. Now coming to the above error, the error message says that you have disabled third-party cookies in your Chrome browser. However, in my case, I have not disabled third-party cookies for any site. So, what’s the solution? Well, the solution is enabling third-party cookies in the Chrome browser and restart the browser. But, what if you have third-party cookies enabled and yet receiving the same message repeatedly? The solution is to check your Cookies exception list and if necessary delete and reinstall the extension again. Follow the below given steps to see how to fix your browser is Blocking Grammarly Editor. Before you proceed with the below given steps to fix this error, try Grammarly’s own diagnostic test. Go to https://app.grammarly.com/diagnostic-test and an automatic diagnostic test will initialize. After few seconds you can view the diagnostic test result. If you see “Oh no! It looks like something is indeed wrong with your connection.Please contact support so we can work with you to resolve this issue.” message then click on the Contact Support link to contact the Grammarly technical team. If you see a success message, but still facing the error, follow below given steps to fix it. The first thing you should do is check whether you have disabled third-party cookies in Chrome browser. Even if you don’t remember it doing personally, you still may need to check your Cookies settings. 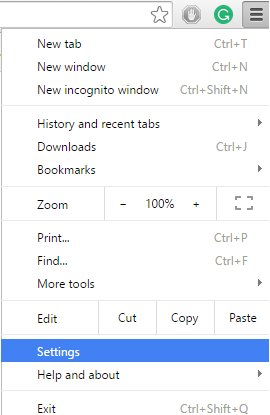 Click on Menu icon (three horizontal lines) from the top right corner. From the context menu, select Settings. From settings, scroll down and click on Advanced Settings. Under Privacy section, click on “Content” setting button. Make sure that “Allow local data to be set (recommended)” is selected. Also, make sure that “Block third-party cookies and site data” option is unchecked. Click on Done button at the bottom to save the settings. 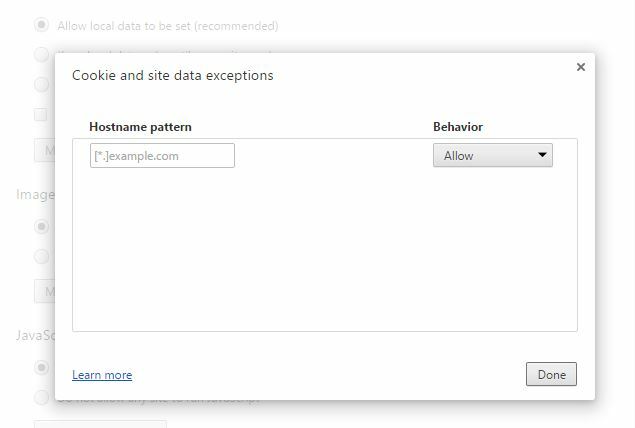 If Cookies and third-party cookies are enabled, check the cookie and site data exceptions settings. Go to Settings, click on Advanced settings and select Content Settings. Click on Manage exception and see if you have any unknown URL (that you haven’t added yourself to the exception list) added and blocked. If you have any, click on the URL and select Allow from the behavior section. Click on Done to save the settings. Now restart Chrome browser and see if the error in Grammarly editor has been resolved. If the above steps didn’t work for you, then you can try to remove the Grammarly Editor from the extension settings and then reinstall it from the Chrome Store. Click on Menu (three horizontal lines), go to More tools and select Extensions from the context menu. From the list of installed extensions, find Grammarly Editor and click on trash can icon to delete it. Now go to Chrome store here and install Grammarly Editor extension by clicking on Add button. Once added, restart the browser and see if the error has been resolved. In most of the cases reinstalling the Grammarly Editor in Chrome can fix this issue.